Security guards are seen by many owners as a substantial business expense. But this is the wrong way to look at it. Rather than an expense, security guards are an investment in your business. That’s because security guards can save businesses money in a lot of different ways. The truth is that virtually any business could see an increase in their bottom line if they employed one or a team of security guards. Here’s why security guards are worth the money. When people feel safe in a store or office, they are more likely to come to that store and they are more likely to work harder or spend more money. Security guards offer both offices and retail stores this benefit. When security officers patrol your offices, employees feel safe coming to work. When security officers patrol stores, customers know they will be safe shopping there and will be protected if something happens. One large, inconvenient expense for both offices and stores occurs when property is damaged by vandalism. When a workplace or a retail store gets vandalized, it is important that everything is replaced and repaired immediately to reduce negative impacts on the business. No one wants to spend money in a vandalized shop or do business with a firm in a vandalized office. A security system comprised of both security guards and surveillance cameras is an excellent way to remove the threat of vandalism completely. With your business monitored day and night, vandals won’t have a chance to damage your property. Shoplifting is a huge problem for stores that do not have a sufficient security presence. Of course, the risk of shoplifters can never be eliminated completely, but when you have both security guards and CCTV cameras in operation, thieves have very little chance to successfully make off with your goods. That means fewer lost products and more sales. In the same vein as the previous point, security guards can also eliminate the possibility that stores or offices are robbed. Businesses that hold large amounts of cash on-site are prime targets for would-be criminals, and thefts can result in big losses. A strong security presence is often enough to discourage thieves. And armed security guards can neutralize a thief, should one try to perpetrate a crime regardless. Not just any security guard will save you money, however. 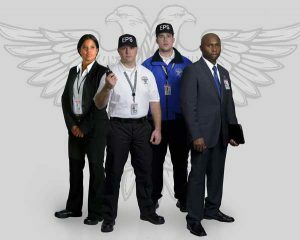 If you are serious about increasing the safety and security of your business — and seeing an increase in profits as a result — then you need to take time to make sure that you only hire experienced and well-trained security officers. This means speaking to a number of highly rated security service providers like Echelon Protection & Surveillance. Call our team today at 610 831 0277 for a free consultation to discuss your security plan.